The selection committee has been chosen, coaching applications have been submitted and the player deadline is looming. Soon enough, the third edition of Team USA will be appointed. The committee has a tall task ahead of it, but we’re here to help! This series will feature players who have yet to don a gold medal for our country but we feel are deserving of such an honor. MLQ gave us something the Team USA committee should hold in high regard: a statistics board for players who were playing outside of their regular season team’s system, as they will be for Team USA. Among players who were rostered for all nine regular season MLQ matches, Boettner ranked third in goals per game (with the best shooting percentage [87%] in the top eight scorers) and second in assists, leaving him highest in the combined total of the two. The most impressive part of those statistics? Boettner played chaser for the vast majority of his shifts with high-usage keepers, meaning he was not the first option and was making the most of a comparatively small number of chances. Boettner was also in the top 10 of MLQ’s defensive statistics, using some of the best instincts in the game to snuff out opposing possessions. 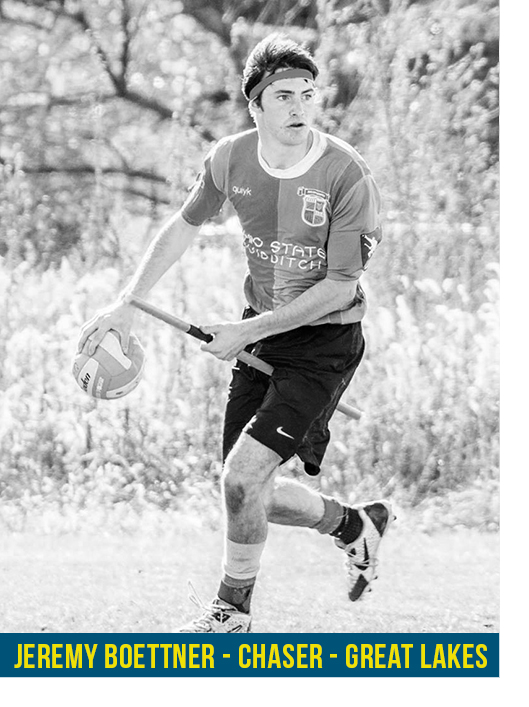 Even though Boettner has had to play beater for much of the 2015-16 USQ season, he has historically shown to be one of the best quaffle players the Great Lakes has ever offered, and has still excelled when he gets the opportunity to play in the quaffle game. Chris Scholz is an absolute dream, and I am not just talking about his eyes. 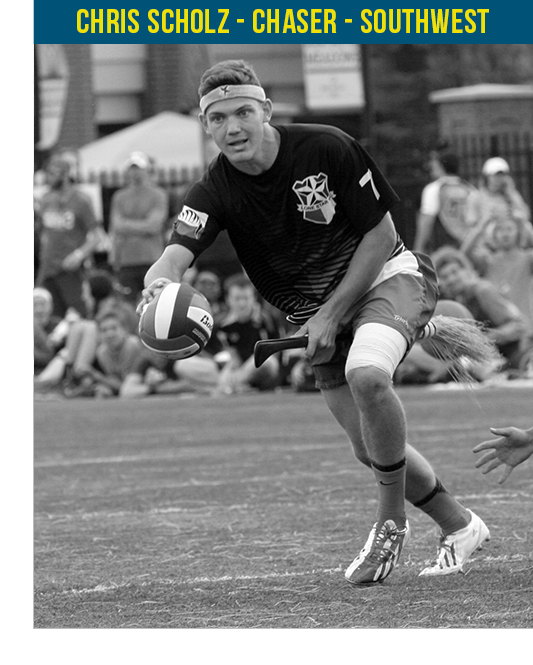 His combination of size, speed, strength, explosiveness and agility put him in a class with the most elite athletes to ever take the field at World Cup, and has given him the foundation necessary to mature into a major contributor on veteran-heavy Lone Star Quidditch Club despite being barely 21 years old. What really sets Scholz apart from his peers, however, are his intangibles: coachability, toughness and passion. A squad like Team USA cannot function properly without role players—those willing to take on smaller, more specialized roles for the sake of the team, regardless of their overall skill. Scholz’s coachability makes him an ideal Team USA role player. He is incredibly humble, asks for criticism and has a proven track record of making situational adjustments to his game when needed (including rotating as a 1.5 beater sub for Lone Star last season). Scholz is a perfect candidate for the “spark plug” role on Team USA: a high octane, aggressive player who can be subbed in to reenergize the team and dictate the pace of the game when things get lackadaisical. Nothing better illustrates Scholz’ aforementioned toughness and passion than the opening moments of the World Cup 8 final. 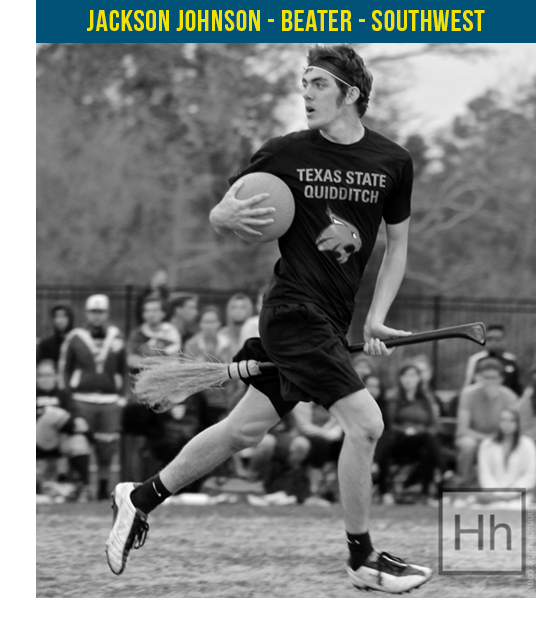 On brooms up, he blew away the rest of the field (which included Simon Arends and Augustine Monroe at beater) to win the quaffle, and proceeded to drive through all four University of Texas defenders to score the game’s opening dunk. On the ensuing possession, he tore the ball away from Marty Bermudez deep in the defensive zone and went coast to coast for back-to-back goals. And he did all of it with a broken leg. Take a seat, Greg Jennings. Of all the great players that I have had the privilege of coaching, Scholz is unquestionably one of my favorites. Team USA should be just as privileged to call him its own. In a region famous for its two star keepers, Tony Rodriguez and Alex Browne, neither Ben Harding nor the Santa Barbara Blacktips have gotten enough fanfare over the years. Harding started as an off-ball chaser for Santa Barbara in the spring of 2013. Paired up with Ren Bettendorf through the World Cup VII season in the legendary combo known as Ren-Ben, the two would combine pretty passing and brute strength that put on an absolute show against weak defenses and effectively scored on some of the best defenses. When Bettendorf moved on to the LA Gambits for the World Cup 8 season, Harding took the reigns of the Blacktips and the team managed to only get better by losing its best player in Bettendorf—if he were actually its best player. Harding became the ball-carrying keeper, and proved he could run a formidable offense with smart decision-making and skillful passing. He turned a speedy chaser unit of Jeremy McIntyre, Sara Weman, Austin Goodheart and Justin Fernandez into big-time scorers, and is even more dangerous as a driving thread than a passing threat. Harding’s best resume point for Team USA is his flexibility in positions. In a crowded keeper field, Harding may be best fit to move back to chaser for Team USA. He is uniquely capable of knowing what role he is in and adapting to be one of the best players in the country at that position. Whether Team USA needs him to ball carry and distribute or play the role of off-ball receiver, he will do it dominantly. Santa Barbara quietly made a Sweet 16 run last year, falling in a close game to University of Maryland, and, with Harding at the helm, will not being slowing down this season. 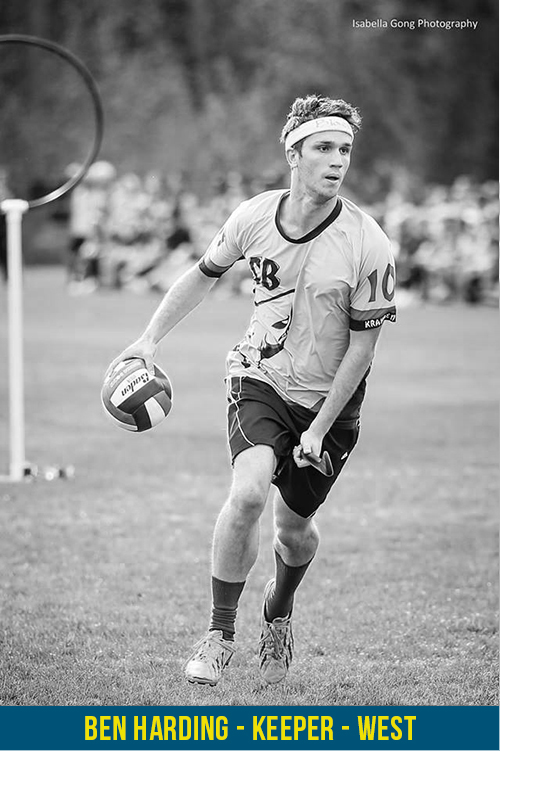 He will lead the Blacktips to a successful West Regional Championship and US Quidditch Cup 9 performance, and he stands a great chance of being recognized for Team USA because of it. When you think of Southwest beating, the first thing to come to mind should be Jackson Johnson. A staple in the Southwest, Johnson has been slowly making his way to the top of the upper echelon of beaters. He began his career in 2013, gaining national attention as part of Texas State’s run to the finals of World Cup VII. The next year he saw himself starting often and gaining more attention as a player in his own right, instead of just as Ryan Peavler’s sub. This year, Johnson has been almost single-handedly carrying the Texas State beater corps. With beater partners and subs that do not have a large impact on the game, Johnson has had to carry an extremely large burden. What is most impressive, however, is the uptempo speed in which he plays, considering the number of minutes he puts in. Though Johnson is a standout no matter what is happening on the field, it is during snitch on pitch that this highly effective player becomes a defensive machine. Using speed, endurance, high-precision beats and an exceptional game IQ, Johnson becomes an even more terrifying foe to encounter. Thanks in large part to his play, Texas State has yet to lose an official game in range this season.